Transitions between two clips by breaking them into strips and sliding them off the screen one at a time to reveal the incoming clip. 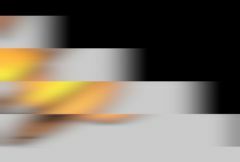 Motion Blur: Default: 0.3, Range: 0 or greater. Scales the amount of motion blur to use. Strip Angle: Default: 0, Range: any. Controls the angle along which the strips are divided, and also the direction in which they slide. This parameter can affect the timing of the strips, so animating it is not recommended. Strip Shift: Default: 0, Range: any. Adjusts the position of the strip boundaries. This parameter can affect the timing of the strips, so animating it is not recommended. Strip Size: Default: 0.1, Range: 0.01 or greater. The width of the strips. This parameter can affect the timing of the strips, so animating it is not recommended. Randomize Size: Default: 0, Range: 0 or greater. Makes some strips larger and some smaller, at random. Style: Popup menu, Default: Slide Off . Controls which clip the slide is applied to. Slide Off: The outgoing clip slides off to reveal the incoming clip. Slide On: The incoming clip slides on over the outgoing clip. Side by Side: The outgoing clip slides off while the incoming clip slides on next to it. Speed: Default: 10, Range: 1 or greater. The speed at which each strip moves. As speed increases, the delay between strips becomes larger. If the speed is low, many strips will be in motion at the same time, creating a wave or ripple effect. This parameter affects the timing of the strips, so animating it is not recommended. Slow Start: Default: 1, Range: 0 to 1. Controls the acceleration of each strip as it moves. If set to zero, the strip will start moving at full speed. With larger values, the strip will start moving more slowly and accelerate up to its full speed, resulting in smoother motion. Initializes the random number generator for random strips sizes and order. The actual seed value is not significant, but different seeds give different results and the same value should give a repeatable result. Order: Popup menu, Default: Top Down . Controls the order in which the strips slide off screen. Top Down: in order from top to bottom. Bottom Up: in order from bottom to top. Center Out: outward from the center, alternating strips above and below the center. Edges In: inward from the edges, alternating strips above and below the center.